Artwork by Matthew Helton, a fine art and photography student at Wright State, will be displayed at the Dayton Art Institute as part of the Yeck College Artist Fellowship from May 10 through Aug. 19. When he was a boy, his artistic-minded parents would take him to the Dayton Art Institute, where he was dazzled by the paintings, sculptures and photos of world-class artists. Today, Matthew Helton, a fine art and photography student at Wright State University, is about to have his work displayed in the same space as the artists he looked up to. Helton and two other Wright State students — Nanci Payne and Nancy Shuler — will have their artwork displayed at the museum as part of the Yeck College Artist Fellowship. The show runs from May 10 through Aug. 19. The Dayton Art Institute opened as an art school in 1919 and has been called “Dayton’s living room.” The museum’s collections contain more than 26,000 objects spanning 5,000 years. Notable works include those by Monet, Rubens, Degas, O’Keeffe, Hopper and Warhol. The Yeck fellowships are supported by the Yeck Education Endowment Fund, which promotes and enhances the development of promising young artists. In addition to creating a body of museum-class work to be displayed, the Fellows are required to teach art to a dozen selected high school students from eight different school districts. “The college students also learn how to teach, using that as a skillset they will probably need as working artists later in their career,” said Christine Fleming, museum educator for school programs at the institute. But she said the Yeck programs are designed to cultivate a passion for the arts whether or not participants pursue art as a career. This year’s fellowship program began in September with the college students planning their artwork and developing the curriculum. The classes were then held weekly at the institute from January through April. About a dozen Yeck scholarship winners from area public and private high schools took part in the classes. Four college students were selected from a pool of 10 applicants following interviews and a review of their portfolios. Each Wright State student excels in a different media — from photography to painting to a painting/drawing, ink-brush mix. “Wright State has a great art program, and it’s a great group of students,” said Fleming. Helton, a native of Fairborn, was drawn to photography at an early age. “I always had a camera growing up. And I was the guy always taking pictures on my phone no matter where I went,” he said. However, it wasn’t until he took his first photo with a professional camera that he realized photography could be far more than just taking family and vacation snapshots. 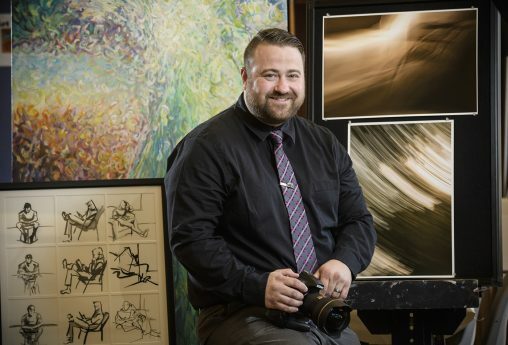 And so when he began his career at Wright State in pre-health, Helton quickly gravitated toward photography and ultimately changed his major to fine art with an emphasis on photography. He was able to sharpen his techniques and began creating artwork with depth, where the images actually stood for something or represented something else. Helton plans to pursue his master’s degree and would like to teach photography at the college level. But he also aspires for a career as a photographer for National Geographic magazine. “You are really immersed in the cultures and the things you are photographing, which I think is amazing,” he said. Helton said the Yeck program has taught him how to build curriculums and mold students, pushing them to achieve their potential. The students did drawings, paintings, sculptures, origami and photography. In one class, Helton taught art history by requiring the students to walk through the museum and identify artworks that represented art-related words and concepts like chiaroscuro — or contrasted light and shadow. “The idea was to open their minds as they make their artwork, get them to look at something they may not have really examined,” he said. The high school students will get a chance to display their artwork during the opening reception for the exhibit May 10.